Antigone ( /ænˈtɪɡəni/ ann-TIG-ə-nee; Ancient Greek : Ἀντιγόνη) is a tragedy by Sophocles written in or before 441 BC. Of the three Theban plays Antigone is the third in order of the events depicted in the plays, but it is the first that was written. The play expands on the Theban legend that predates it, and it picks up where Aeschylus' Seven Against Thebes ends. Aeschylus was an ancient Greek tragedian. He is often described as the father of tragedy. Academics' knowledge of the genre begins with his work, and understanding of earlier tragedies is largely based on inferences from his surviving plays. According to Aristotle, he expanded the number of characters in the theater and allowed conflict among them; characters previously had interacted only with the chorus. Seven Against Thebes is the third play in an Oedipus-themed trilogy produced by Aeschylus in 467 BC. The trilogy is sometimes referred to as the Oedipodea. It concerns the battle between an Argive army led by Polynices and the army of Thebes led by Eteocles and his supporters. The trilogy won the first prize at the City Dionysia. The trilogy's first two plays, Laius and Oedipus, as well as the satyr play Sphinx, are no longer extant. In Greek mythology, Eteocles was a king of Thebes, the son of Oedipus and either Jocasta or Euryganeia. The name is from earlier *Etewoklewes (Ἐτεϝοκλέϝης), meaning "truly glorious". Tawagalawas is thought to be the Hittite rendition of the name. Oedipus killed his father Laius and married his mother without knowing his relationship to either. When the relationship was revealed, he was expelled from Thebes. The rule passed to his sons Eteocles and Polynices. However, because of a curse from their father, the two brothers did not share the rule peacefully and died as a result, ultimately killing each other in battle for control of the city. Upon his death, Eteocles was succeeded by his uncle, Creon. 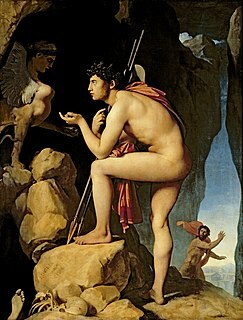 In Greek mythology, Polynices was the son of Oedipus and Jocasta and the younger brother of Eteocles. When his father, Oedipus, was discovered to have killed his father and married his mother, he was expelled from Thebes, leaving his sons Eteocles and Polynices to rule. Because of a curse put on them by their father Oedipus, the two sons did not share the rule peacefully and died as a result, killing each other in battle for control over Thebes. Creon, is a figure in Greek mythology best known as the ruler of Thebes in the legend of Oedipus. He had four sons and three daughters with his wife, Eurydice : Henioche, Pyrrha, Megareus, Lycomedes and Haimon. Creon and his sister, Jocasta, were descendants of Cadmus and of the Spartoi. He is sometimes considered to be the same person who purified Amphitryon of the murder of his uncle Electryon and father of Megara, first wife of Heracles. According to Sophocles' play Antigone, Haemon or Haimon, was the mythological son of Creon and Eurydice, and thus, brother of Menoeceus (Megareus), Lycomedes, Megara, Pyrrha and Henioche. Tiresias, the blind prophet, enters. Tiresias warns Creon that Polyneices should now be urgently buried because the gods are displeased, refusing to accept any sacrifices or prayers from Thebes. Creon accuses Tiresias of being corrupt. Tiresias responds that because of Creon's mistakes, he will lose "a son of [his] own loins"  for the crimes of leaving Polyneices unburied and putting Antigone into the earth (he does not say that Antigone should not be condemned to death, only that it is improper to keep a living body underneath the earth). All of Greece will despise Creon, and the sacrificial offerings of Thebes will not be accepted by the gods. The leader of the chorus, terrified, asks Creon to take Tiresias' advice to free Antigone and bury Polyneices. Creon assents, leaving with a retinue of men. The chorus delivers a choral ode to the god Dionysus (god of wine and of the theater; this part is the offering to their patron god). A messenger enters to tell the leader of the chorus that Antigone has killed herself. Eurydice, Creon's wife and Haemon's mother, enters and asks the messenger to tell her everything. The messenger reports that Creon saw to the burial of Polyneices. When Creon arrived at Antigone's cave, he found Haemon lamenting over Antigone, who had hanged herself. 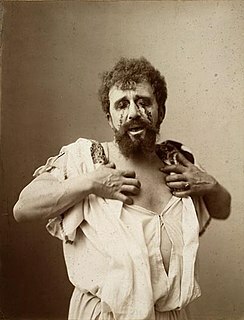 After unsuccessfully attempting to stab Creon, Haemon stabbed himself. Having listened to the messenger's account, Eurydice disappears into the palace. In Greek mythology, Tiresias was a blind prophet of Apollo in Thebes, famous for clairvoyance and for being transformed into a woman for seven years. He was the son of the shepherd Everes and the nymph Chariclo. Tiresias participated fully in seven generations in Thebes, beginning as advisor to Cadmus himself. Dionysus is the god of the grape-harvest, winemaking and wine, of fertility, ritual madness, religious ecstasy, and theatre in ancient Greek religion and myth. Wine played an important role in Greek culture, and the cult of Dionysus was the main religious focus for its unrestrained consumption. His worship became firmly established in the seventh century BC. 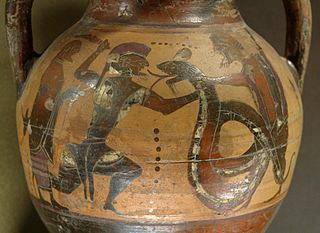 He may have been worshipped as early as c. 1500–1100 BC by Mycenaean Greeks; traces of Dionysian-type cult have also been found in ancient Minoan Crete. His origins are uncertain, and his cults took many forms; some are described by ancient sources as Thracian, others as Greek. In some cults, he arrives from the east, as an Asiatic foreigner; in others, from Ethiopia in the South. Some scholars believe that Dionysus is a syncretism of a local Greek nature deity and a more powerful god from Thrace or Phrygia such as Sabazios or Zalmoxis. He is a god of epiphany, "the god that comes", and his "foreignness" as an arriving outsider-god may be inherent and essential to his cults. He is a major, popular figure of Greek mythology and religion, becoming increasingly important over time, and included in some lists of the twelve Olympians, as the last of their number, and the only god born from a mortal mother. His festivals were the driving force behind the development of Greek theatre. In Greek mythology, Eurydice sometimes called Henioche, was the wife of Creon, a king of Thebes. Antigone, compared to her beautiful and docile sister, is portrayed as a heroine who recognizes her familial duty. Her dialogues with Ismene reveal her to be as stubborn as her uncle. In her, the ideal of the female character is boldly outlined. She defies Creon’s decree despite the consequences she may face, in order to honor her deceased brother. Ismene serves as a foil for Antigone, presenting the contrast in their respective responses to the royal decree. Considered the beautiful one, she is more lawful and obedient to authority. She hesitates to bury Polyneices because she fears Creon. The Chorus, a group of elderly Theban men, is at first deferential to the king. Their purpose is to comment on the action in the play and add to the suspense and emotions, as well as connecting the story to myths. As the play progresses they counsel Creon to be more moderate. Their pleading persuades Creon to spare Ismene. They also advise Creon to take Tiresias's advice. Antigone was written at a time of national fervor. In 441 BC, shortly after the play was performed, Sophocles was appointed as one of the ten generals to lead a military expedition against Samos. It is striking that a prominent play in a time of such imperialism contains little political propaganda, no impassioned apostrophe, and, with the exception of the epiklerate (the right of the daughter to continue her dead father's lineage),  and arguments against anarchy, makes no contemporary allusion or passing reference to Athens. Rather than become sidetracked with the issues of the time, Antigone remains focused on the characters and themes within the play. It does, however, expose the dangers of the absolute ruler, or tyrant, in the person of Creon, a king to whom few will speak freely and openly their true opinions, and who therefore makes the grievous error of condemning Antigone, an act which he pitifully regrets in the play's final lines. Athenians, proud of their democratic tradition, would have identified his error in the many lines of dialogue which emphasize that the people of Thebes believe he is wrong, but have no voice to tell him so. Athenians would identify the folly of tyranny. Creon's decree to leave Polyneices unburied in itself makes a bold statement about what it means to be a citizen, and what constitutes abdication of citizenship. It was the firmly kept custom of the Greeks that each city was responsible for the burial of its citizens. Herodotus discussed how members of each city would collect their own dead after a large battle to bury them. 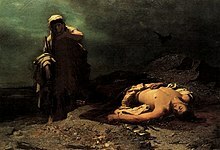 In Antigone, it is therefore natural that the people of Thebes did not bury the Argives, but very striking that Creon prohibited the burial of Polyneices. Since he is a citizen of Thebes, it would have been natural for the Thebans to bury him. Creon is telling his people that Polyneices has distanced himself from them, and that they are prohibited from treating him as a fellow-citizen and burying him as is the custom for citizens. Right after World War II, Bertolt Brecht composed an adaptation, Antigone , which was based on a translation by Friedrich Hölderlin and was published under the title Antigonemodell 1948. The 1978 omnibus film Germany in Autumn features a segment by Heinrich Böll entitled “The Deferred Antigone”  where a fictional production of Antigone is presented to television executives who reject it as ”too topical”  . ↑ Sophocles (1986). The Three Theban Plays: Antigone, Oedipus the King, Oedipus at Colonus. Translated by Robert Fagles. New York: Penguin. p. 35. ↑ Sophocles (1947). Sophocles: The Theban Plays (Penguin Classics). Translated by E.F. Watling. The Penguin Group. 1 2 Bates, Alfred, ed. (1906). The Drama: Its History, Literature and Influence on Civilization, Vol. 1. London: Historical Publishing Company. pp. 112–123. ↑ Rosenfield, Kathrin H. (2010). Antigone: Sophocles' Art, Hölderlin's Insight. Translated by Charles B. Duff. Aurora, Colorado: The Davies Group, Publishers. pp. 1–22. ISBN 978-1934542224. ↑ Letters, F. J. H. (1953). The Life and Work of Sophocles. London: Sheed and Ward. pp. 147–148. 1 2 Collins, J. Churtin (1906). "The Ethics of Antigone". Sophocles' Antigone. Translated by Robert Whitelaw. Oxford: Clarendon Press. ↑ Else, Gerald F. (1976). The Madness of Antigone. Heidelberg: Carl Winter Universitätsverlag. p. 43. ↑ Ferguson, John (2013). A Companion to Greek Tragedy. University of Texas Press. p. 173. ISBN 9780292759701. ↑ Jebb, Sir Richard C. (1900). "Verse 429". Sophocles: The Plays and Fragments, with critical notes, commentary, and translation in English prose. Part III: The Antigone. Cambridge: Cambridge University Press. 1 2 Rose, J. L. (March 1952). "The Problem of the Second Burial in Sophocles' Antigone". The Classical Journal. 47 (6): 220–221. JSTOR 3293220. ↑ Honig, Bonnie (2011). "ISMENE'S FORCED CHOICE: SACRIFICE AND SORORITY IN SOPHOCLES' ANTIGONE" (PDF). Arethusa. The Johns Hopkins University Press. 44: 29–68. 1 2 Levy, Charles S. (1963). "Antigone's Motives: A Suggested Interpretation". Transactions of the American Philological Association . 94: 137–44. doi:10.2307/283641. JSTOR 283641. ↑ Sophocles (1991). Sophocles: Oedipus the King, Oedipus at Colonus, Antigone. Translated by David Grene. University of Chicago Publishers. p. Line 48. ISBN 978-0-226-30792-3. 1 2 MacKay, L. (1962). "Antigone, Coriolanus, and Hegel". Transactions and Proceedings of the American Philological Association. 93: 178–179. JSTOR 283759. ↑ Medrek, T.J. (November 6, 1999). "BU Opera fest's 'Antigone' is a lesson in excellence". Boston Herald . p. 22. Retrieved March 8, 2010. ↑ Grupo Cultural Yuyachkani: Antígona [Yuyachkani Cultural Group: Antigone]. Scalar (in Spanish). 11 March 2011. Retrieved 24 March 2018. ↑ "نگاهی به نمایش "آنتیگونه" نوشته و کار "همایون غنی‌زاده"" [Take a look at the "Antigone" display of Homayoun Ghanizadeh]. Irani Art (in Persian). February 1389. Retrieved 24 March 2018. ↑ Hickling, Alfred (September 23, 2014). "Antigone Review – engaging Gangland Sophocles". The Guardian. ↑ Fordham, Alice (December 13, 2014). "Syrian Women Displaced By War Make Tragedy Of 'Antigone' Their Own". National Public Radio. ↑ "Antigone: Cast & creative". National Theatre. The Royal National Theatre. Archived from the original on 31 August 2012. Retrieved 23 July 2018. ↑ Billington, Michael (31 May 2012). "Antigone – review". The Guardian. Retrieved 5 December 2015. ↑ "The Deferred Antigone (Germany in Autumn, 1978)". YouTube. Retrieved 30 June 2018. ↑ Gillespie, Jill. "Deutschland Im Herbst - Film (Movie) Plot and Review". FilmReference. Retrieved 30 June 2018. Heidegger, Martin; McNeill, William; Davis, Julia (1996). Hölderlin's Hymn "The Ister" . Bloomington: Indiana University Press. Wikimedia Commons has media related to Antigone . In Greek mythology, Antigone is the daughter of Oedipus and his mother Jocasta. The meaning of the name is, as in the case of the masculine equivalent Antigonus, "worthy of one's parents" or "in place of one's parents". Ismene is the name of the daughter and half-sister of Oedipus, daughter and granddaughter of Jocasta, and sister of Antigone, Eteocles, and Polynices. She appears in several plays of Sophocles: at the end of Oedipus Rex, in Oedipus at Colonus and in Antigone. She also appears at the end of Aeschylus' Seven Against Thebes. Oedipus at Colonus is one of the three Theban plays of the Athenian tragedian Sophocles. It was written shortly before Sophocles's death in 406 BC and produced by his grandson at the Festival of Dionysus in 401 BC. The Phoenician Women is a tragedy by Euripides, based on the same story as Aeschylus' play Seven Against Thebes. The title refers to the Greek chorus, which is composed of Phoenician women on their way to Delphi who are trapped in Thebes by the war. Unlike some of Euripides' other plays, the chorus does not play a significant role in the plot, but represents the innocent and neutral people who very often are found in the middle of war situations. Patriotism is a significant theme in the story, as Polynices talks a great deal about his love for the city of Thebes but has brought an army to destroy it; Creon is also forced to make a choice between saving the city and saving the life of his son. The Suppliants, also called The Suppliant Maidens, or The Suppliant Women, first performed in 423 BC, is an ancient Greek play by Euripides. The Thebaid is a Latin epic in 12 books written in dactylic hexameter by Publius Papinius Statius. The poem deals with the Theban cycle and treats the assault of the seven champions of Argos against the city of Thebes. Antigona (Antigone) is an opera in three acts in Italian by the composer Tommaso Traetta. The libretto, by Marco Coltellini, is based on the tragedy Antigone by Sophocles. But there is also an opera Antigona by Josef Mysliveček. Antigone is a 1961 Greek film adaptation of the Ancient Greek tragedy Antigone by Sophocles. It stars Irene Papas in the title role and was directed by Yorgos Javellas. In Greek mythology, Megareus or Menoeceus (Μενοικεύς) was a warrior of Thebes, who figures in the war of the Seven Against Thebes - the struggle between Eteocles and Polynices, the twin sons of Oedipus, for the throne of Thebes. He was known for his large stature, and is considered an anthropomorphic representation of his father's pride by some literary scholars. Welcome to Thebes is a 2010 play by Moira Buffini. It premiered on 15 June 2010 in a production at the Olivier Theatre of the Royal National Theatre in London directed by Richard Eyre. Antigone is a play by the Attic dramatist Euripides, which is now lost except for a number of fragments. According to Aristophanes of Byzantium, the plot was similar to that of Sophocles' play Antigone, with three differences. The date of the play is uncertain, but there is evidence that it was written late in Euripides' career, between 420 BCE and 406 BCE. Antígona Furiosa, written in the period of 1985-86 by Griselda Gambaro, is an Argentinian drama heavily influenced by Antigone by Sophocles, and comments on an era of government terrorism that later transformed into the Dirty War of Argentina.Antígona Furiosa was first published 1989 in Griselda Gambaro: Teatro 3 in Buenos Aires, after it stayed many years hidden while Gambaro was in exile in Barcelona. The play premiered September 24, 1986 at the Goethe Institute in Buenos Aires under the direction of Laura Yusem.